No one likes Mitt Romney. That’s not a personal swipe. It’s a fact—on Tumblr, anyway. In May, Romney’s presidential campaign launched mittromney.tumblr.com, hoping to take advantage of the popular microblogging platform to amplify the former Massachusetts governor’s message and present a slightly more hip image of the candidate to the site’s 58 million users. Romney’s campaign has published 40 posts on a variety of topics ranging from clean energy to education policy to cupcakes; at first glance, it has all the makings of a successful social-media campaign, filled with Instagram snapshots, flashy videos, and slick infographics. The campaign’s Tumblr is missing one key thing, however: readers. Of the more than three dozen entries, nearly half have passed by with nary a note, Tumblr’s de facto metric for determining the popularity of an item. (Users can choose to reblog posts that they like on their own blogs, or simply “like” an entry.) None have received more than seven notes, with the notable exception of a May photo of two dozen vanilla cupcakes that received 61 reblogs and likes, largely because it had been reblogged by—ahem—Mother Jones‘ popular Tumblr feed (full disclosure: It was me). For perspective, this photo of a bottle of glazed donut vodka currently has 1,741 notes. Although it lacks the organizing and fundraising potential of more-established platforms like Twitter and Facebook, Tumblr has come into its own in political circles over the last year. At their most effective, Tumblrs hammer home a single idea or narrative (like We Are the 99 Percent, a compendium of user-submitted horror stories of economic distress) or reinforce a caricature (see: Newt Judges You, curated by conservative commentator Ben Domenech). But Romney’s floundering Tumblr outreach underscores the GOP’s ongoing struggle to win over young voters. Think of it as the geezer gap. Rubenstein points to demographic info collected by the online data firm Quantcast. Although somewhat imprecise, the trend lines are clear: 62 percent of users are under the age of 35. The percentage of 18-to-24-year-olds on Tumblr is roughly double the internet average. Just 2 percent are older than 65. Tumblr users are substantially more diverse and better educated (owing to the high proportion of young folks). It’s also slightly more female than the rest of the net. Feel the excitement. mittromney.tumblr.comAlthough conservatives have planted their flag on Tumblr, their efforts so far have yielded few returns. Obama in History, a project of the Republican National Committee designed to make light of the White House’s ill-considered decision to insert references to the president into other presidents’ bios, was a comparative dud. 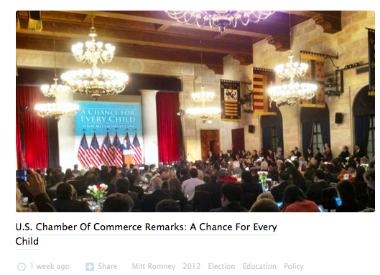 The RNC’s main Tumblr, RNC Research is, like the Romney page, frequently updated but rarely commented-on. Romney, whose campaign did not respond to a request for comment, has left a mark on Tumblr, just not in the way he may have wanted. When his digital media team misspelled “America” on the campaign’s new iPhone app (a subsequent update was also marred by a typo), Tumblr pounced. Amercia is with Mitt! quickly went viral. By contrast, President Obama’s reelection campaign seems to have mastered the medium. The campaign’s official Tumblr includes an ask-me-anything button (Romney’s only asks for donations) and frequently publishes answers; it posts letters from supporters and reblogs other users, be they pseudonymous fans or comparative heavyweights with large follower counts of their own. Most importantly, it plays the game. There are inspirational quotes and campaign videos, yes, but also .gifs (a very short video clip repeated on loop), memes, and a constant engagement with the progressive Tumblr community. You’ll find a photo of an absence note Obama wrote for a fifth-grader (11,211 notes), a baby in an Obama-Biden onesie (630 notes), and a reference to the cult-favorite television show Friday Night Lights (2,380 notes). The back-and-forth between the campaign’s Tumblr and its followers, and the enthusiasm it engenders, is typified by the story of April Watkins. In December, the University of Kentucky grad, who blogs under the nickname Apsies, launched an online campaign to get Obama to follow her on Tumblr. Watkins posted a .gif of Leslie Knope, Amy Poehler’s character in Parks and Recreation, frowning, with the caption “Barack Obama still hasn’t followed me.” It quickly picked up steam, and eventually the Obama Tumblr team caught wind. They followed her, reblogged the post with a Parks and Recreation joke—”You had us at Leslie Knope”—and let the good vibes roll. The original post received 8,270 notes; in March, the Obama campaign staff cited it in a slideshow on their social-media strategy. “I spent 20 minutes at home one night reading the response from that and people said, ‘I love you guys, you get it,'” Obama for America digital director Teddy Goff told a panel at South by Southwest that same month. Where’s Mitt Romney’s Long-Form Birth Certificate?